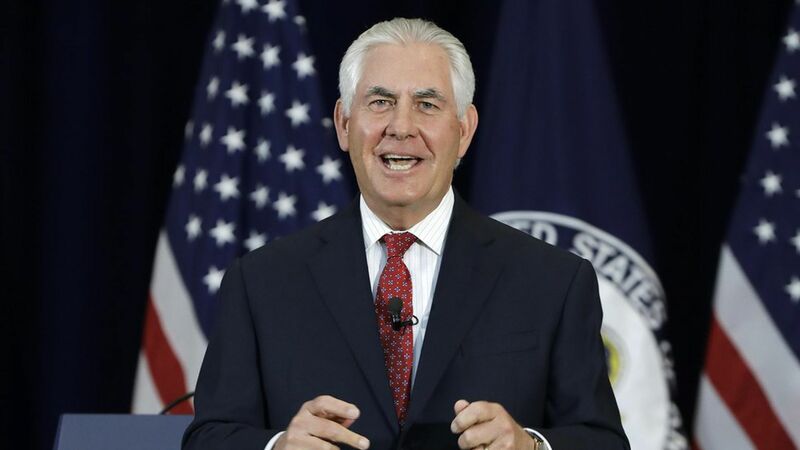 Secretary of State Rex Tillerson addressed State Department employees Wednesday amid reports that he is considering cutting 2,300 jobs from the department — but he didn't address those. He is also facing budget pressures from the administration to cut its funding by about one-third, a limitation that has drawn ire from advocates for international aid and diplomacy — but he didn't address that, either. Instead, he championed "America First" and told the employees that for the State Department, this means an emphasis on national security and economic prosperity. If you read only one thing: A day after Tillerson took Q&A from Model UN students, he did not take questions from his employees after the speech. North Korea: The U.S. is readying additional sanctions against North Korea if its actions warrant them. "I'd say we're at about dial setting 5 or 6 now." China: The first high-level diplomatic and security dialogue with China will take place in June in D.C.
Russia: "We cannot have the two greatest nuclear powers in the world have this kind of relationship…we've got to change it…I don't want to say we're off to a good start." Tillerson will meet with Lavrov in Alaska next week. Mexico: There will be a May 18 meeting to discuss how to break up transnational criminal organizations and the threats of drug flows into the U.S.
Central and Latin America: The U.S. is hosting an event in Miami to talk about pumping private capital investment into Central and Latin America. ISIS: "We've got to move beyond the battle space; we've got to move into the cyber space into the social space, that allows them to recruit into their terrorism efforts." Africa: "We cannot let Africa become the next breeding ground for the emergence of ISIS.